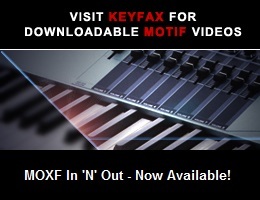 Version 1.01 of the MOX OS has been announced and is available for download from Motifator.com. During Realtime Recording in the Song/Pattern mode, pressing the [REC] button will call up the “Rehearsal” mode. In this mode, the [REC] indicator will flash and playback will continue uninterrupted; however, no data will be recorded, letting you practice a part or try out various ideas (while listening to the other tracks) without actually recording. To return to the Record mode, press the [REC] button again—the [REC] indicator will light continuously. To prevent unnecessary power consumption, this instrument features an Auto Power Off function that automatically turns the power off if the instrument is not operated for a specified period of time. This process can be deactivated. Turn the power on while holding down the lowest key on the keyboard. A “Auto power off disabled.” indication appears briefly and Auto Power Off is disabled. The setting is retained even if the power is turned off.